From 1960 to 1961, when the Kancamagus Highway was being built between Conway and Lincoln, Sherman Adams saw much more than a road. Soon, more than one hundred square miles of wilderness would be open to the public, and he knew a good mountain for skiing was along the route. Loon Mountain in NH opened in 1966, after two years or preparation. Adams' legacy of "skier first" service, quality conditions, and hard work continue to exist at Loon today. Loon Mountain now provides 2,100 feet of vertical skiing with forty-seven trails, six terrain parks, six tree skiing areas, halfpipe, and superpipe. Across from Loon Mountain's main parking lot is the Loon Mountain Adventure Center. The center offers numerous off-slope activities for everyone during the winter season. Activities available include guided snowshoe tours, snowshoeing, cross-country skiing, ice skating, and an indoor climbing wall. Visitors can also take part in a zipline adventure, soaring over seven hundred feet across the Pemigewasset River before crossing back to the Adventure Center. Tubing is also offered for visitors looking for a thrilling ride down the mountain. 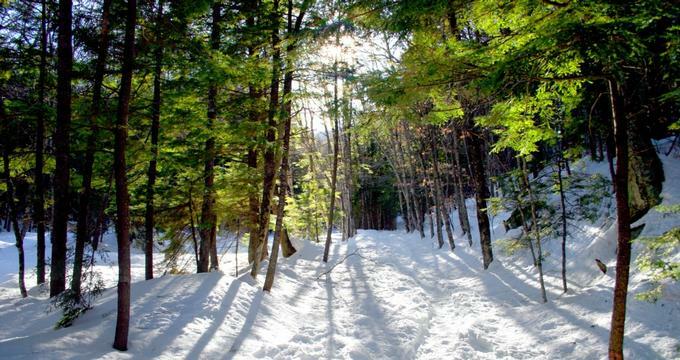 Snowshoe guided tours are offered at Loon Mountain that take participants to the summit of the mountain. Snowshoe tours include gondola access to the mountain's summit and snowshoe rentals. Once at the summit, guests will be able to enjoy a guided snowshoe walk lasting about two hours as they take in stunning views of Mount Washington and the peaks and valleys surrounding it. The tour is suited towards intermediate snowshoers due to somewhat challenging terrain, and ends with either a snowshoe walk or gondola ride back to the base. The winter season isn't the only time to have fun at Loon Mountain. There's plenty to do during the summer and fall seasons as well. One such activity is the Gondola Skyride, the state's longest scenic gondola ride. The ride takes passengers 2,733 feet to Loon Peak's summit. Once at the top, riders will bind spectacular views of the White Mountains and a cool summer breeze. Also at the top are a mountaintop playground, summit glacial caves, a short nature path, and the summit observation tower that offers amazing vistas of the surrounding valley and peaks. The Summit Café offers delicious food and amazing views as well. The Aerial Forest Adventure Park at Loon Mountain offers visitors an opportunity to test their agility and balance by traveling from one platform to another high in the treetops of the forest, soaring across ziplines, climbing ladders, and crossing bridges. The Adventure Park features five courses of various difficulty levels, providing fun for the whole family. The Aerial Forest is a Swiss design, consisting of elements and platforms ranging from nine to more than forty feet above the ground. A handful of the elements found in the Adventure Park include ziplines, Tibetan bridge, oscillating walk, trapeze bridge, chain loops, log suspension bridge, hanging wooden blocks, and log tightrope walk.